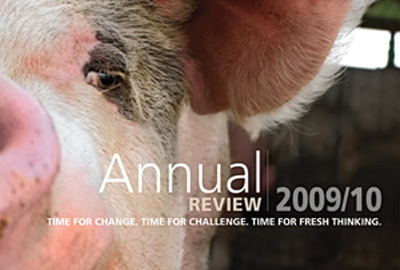 The farm animal welfare charity Compassion in World Farming decided to let others do the talking when it produced its 2009/10 annual report. "We used third party quotes to describe our work and how it benefits millions of farm animals suffering in factory farms," a spokeswoman for the charity says. 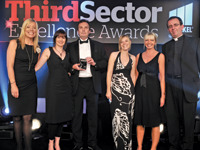 The aim was to inspire existing and potential new donors and to win over opinion leaders. The annual review - produced at a cost of £3,500, including design, print and mailing - is divided into species and 'umbrella campaigns'. It details the problems that affect each animal species and the activities the charity undertakes to tackle them. It also includes information about the progress the charity has made in addressing the problems. The review also includes information about the measurable result of its activities, as well as setting out the challenges facing the charity over the next year. The review was distributed to a wide range of organisations, including grant-making bodies, trusts, foundations, corporate funders, and major donors. It was available in printed format and as a downloadable PDF document from the charity's website. 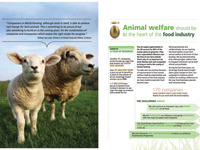 Alistair McLean, chief executive of the Fundraising Standards Board and one of the judges, said: "The impact of the report was very powerful - the theme ran through the report from start to finish and the message of farm animals being treated with compassion and respect was truly delivered." Another of the judges, Brian Lamb, consultant and chair of the campaign effectiveness advisory board at the National Council for Voluntary Organisations, said the annual review presented a "brilliant argument that was well executed, with great visuals". He added: "I was inspired - it had really good pictures that were unified with the text." According to the CIWF spokeswoman, the review is being used by a fundraising consultancy as an example of "the ideal annual review".